The classy new front drag Rarenium CI4+ has a body built from Shimano’s exclusive CI4+ composite. This reduces the weight amazingly compared to metal bodied reels, yet still retains the strength and stiffness required to ensure the internal gears retain their integrity when under pressure. The inclusion of a Magnumlite CI4+ rotor not only reduces weight further, it produces an ultra light rotation which improves the winding sensitivity, making the Rarenium CI4+ a superb lure fishing reel. All models combine Shimano’s exclusive X-Ship gearing with 6 Shielded A-RB bearings. This produces ultra smooth performance combined with maximum winding efficiency. 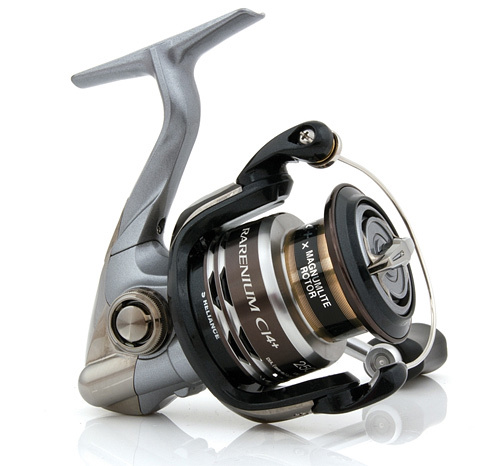 The new Rarenium CI4+ combines ultra light weight feel with powerful winding performance making it one of the most versatile reels in the Shimano front drag range.